WHAT: Still grieving the death of Jean Grey, Logan (Hugh Jackman) is visited by a mysterious Japanese girl (Rila Fukushima) who invites him to Tokyo to pay his respects to her master, Yashida (Hal Yamanouchi), a dying billionaire whose life he once saved during WWII. Yashida claims to have the technology to free Logan of his mutant curse, but when he refuses and the old man dies, Logan reluctantly agrees to protect Yashida’s granddaughter (Tao Okamoto) from the local yakuza, despite losing his healing ability after being poisoned by a snake-like mutant named Viper (Svetlana Khodchenkova). WHY: Hugh Jackman was pretty vocal about atoning for the disappointment of “X-Men Origins: Wolverine,” but while his second solo adventure is a slight improvement, it’s still plagued by some of the same problems (and a few new ones), ultimately resorting to an all-too-familiar formula in the end. Major liberties have been taken with the source material, and there are so many different villains in the story, each with his/her own agenda, that none of them are properly developed. Jackman is still a lot of fun to watch in the role, but the rest of the cast (save for Fukushima’s bright red-haired warrior) leaves much to be desired. At times, even Wolverine himself proves to be a little dull, like when he’s busy moping about Jean Grey, whose appearance here is totally unnecessary. This was supposed to be a standalone movie for Wolverine, and yet writers Mark Bomback and Scott Frank can’t help but muddy the waters with references to the earlier “X-Men” films, making a further hash of the cinematic timeline in the process. “The Wolverine” is an enjoyable character piece thanks to Jackman’s series-best performance, but it’s hardly the definitive Wolverine movie fans were promised. EXTRAS: The Blu-ray release includes an alternate ending, a production featurette titled “The Path of the Ronin” and a set tour of “X-Men: Days of Future Past.” If you stump up for the Unleashed Extended Edition, you’ll also get an unrated extended cut of the film and a commentary by director James Mangold. WHAT: Luke (Jake Johnson) and Kate (Olivia Wilde) are co-workers at a Chicago craft brewery who spend their days drinking beer and hanging out. The two are perfect for each other, but they’re both already in committed relationships. When Kate’s boyfriend suddenly breaks up with her, however, things between the flirtatious friends get complicated. WHY: I’m not a very big fan of the so-called mumblecore movement, because more often than not, the movies are constrained by the very freedom the style seemingly provides. Take for instance: “Drinking Buddies.” Though it’s a charming little indie that doesn’t follow the conventional rom-com route (and should be applauded for doing so), it suffers due to the lack of an actual screenplay. All of the dialogue is improvised by the actors, resulting in some pretty awkward scenes where the characters either ramble on for too long or don’t have anything really interesting to say. There’s something to admire about the authenticity that you gain from this method, but the film feels almost too rough around the edges at times. Thankfully, the cast is great, particularly Jake Johnson and Olivia Wilde, who have such excellent chemistry that it seems like they’ve been best friends for years. 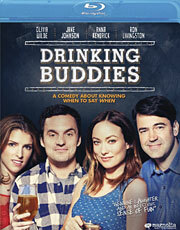 Anna Kendrick and Ron Livingston are also good as their significant others, but without Johnson and Wilde’s lively performances, “Drinking Buddies” would fall flatter than day-old beer. EXTRAS: There’s actually quite a bit of bonus material here, including a commentary with writer/director Joe Swanberg, interviews with the four leads, deleted scenes and a pair of behind-the-scenes featurettes. WHAT: When teenager Clary Fray (Lily Collins) discovers that she descends from a line of demon-hunting warriors called Shadowhunters, she must join forces with others like her to track down the Mortal Cup, a legendary artifact of power that an evil Shadowhunter named Valentine (Jonathan Rhys Meyers) is trying to recover. Taken under the wing of fellow hunter Jace Lightwood (Jamie Campbell Bower), Clary is the only person who knows the whereabouts of the Cup besides her mother, whom Valentine has just kidnapped. 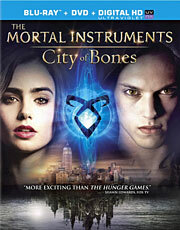 WHY: “The Mortal Instruments: City of Bones” is every bit the bland “Twilight” wannabe that you’d expect. There’s not a single original idea to be found, going so far as to blatantly steal from one of the most popular movies in pop culture history and pretend like no one will notice. Heck, it’s not even the only fantasy series that it rips off. From the overly complex mythology, to the torturous 130-minute runtime, the movie is such an absolute disaster that you have to wonder how the book it’s based on ever got published. “City of Bones” is everything that’s wrong with YA literature. Instead of focusing on writing a good story with interesting characters, it just regurgitates everything that worked before (including more supernatural beasties than an entire season of “Buffy the Vampire Slayer”) and sees what sticks. The two leads have absolutely no chemistry (although that’s fitting considering the big “twist”), and the acting is so awful that you’d think it was meant to be a parody. Unfortunately, that’s not the case, which only makes sitting through this film that much more of a soul-crushing experience. EXTRAS: In addition to an interactive lineage tracker, the Blu-ray includes some deleted scenes and a host of production featurettes on things like the cast, adapting the book for the big screen, stunts, special effects and more. 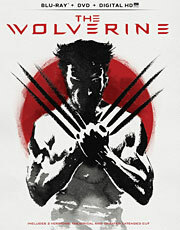 Hugh Jackman has been pretty vocal about atoning for the disappointment of “X-Men Origins: Wolverine” with his latest (and sixth) appearance as the popular mutant, but while “The Wolverine” is a slight improvement on the character’s first solo outing, it’s kind of like giving someone a less bruised piece of fruit and expecting them to be grateful for it. Though director James Mangold should be applauded for trying to do something different with a superhero movie, it’s still plagued by some of the same problems (and a few new ones, as well), ultimately resorting to an all-too-familiar formula in the end. 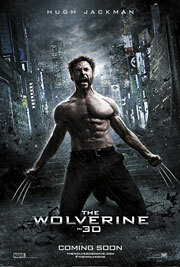 As a character piece, “The Wolverine” is Jackman’s best performance in the role, but as a summer blockbuster, it fails to deliver the Wolverine that audiences want to see. 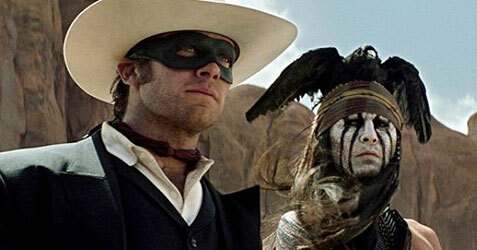 Loosely based on the much-loved miniseries by Chris Claremont and Frank Miller, the film picks up sometime after the events of “X-Men: The Last Stand,” with Logan (Jackman) now living in the woods like an animal and haunted by visions of Jean Grey (Famke Janssen), the woman he loved but was forced to kill. His past catches up to him once again when a mysterious Japanese girl named Yukio (Rila Fukushima) comes to whisk Logan away to Tokyo to pay his respects to her master, Yashida (Hal Yamanouchi), a dying billionaire whose life he once saved as a young soldier during the 1945 bombing of Nagasaki. Yashida claims to have the technology to free Logan of his so-called curse and transfer his mutant powers to someone else, but when he refuses and the old man dies shortly after, Logan reluctantly agrees to protect Yashida’s granddaughter Mariko (Tao Okamoto) from the local yakuza, despite losing his coveted healing ability after he’s poisoned by an evil, snake-like mutant called Viper (Svetlana Khodchenkova).